The Globe Surge Relief Valve is adjusted at the factory to hold closed against the normal operating system pressure: When the system pressure exceeds this setting, the Globe Surge Relief Valve will open immediately to relieve the pressure rise but close slowly (at an adjustable rate) as the system pressure returns to normal. 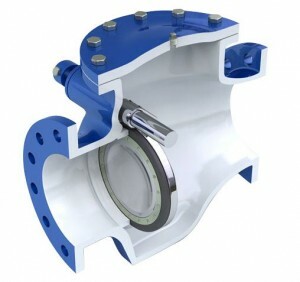 A heavy duty oil dashpot system is externally mounted on the valve to control the rate of closure to prevent or minimize slam. The oil is stored in a hermetically sealed oil reservoir maintaining a constant head on the dashpot to immediately fill the dashpot when the valve opens, to assist in non-slam closure. The closing rate is externally and infinitely adjustable thru a flow control valve having a locking device to prevent tampering once the close rate is set.